Smeet An awesome virtual world for you to roam around in! Everything is possible in the virtual world of Smeet! Farm Days Become a real farmer and renovate the abandoned old farm. Turn it into a successful business full of beautiful crops and cute animals! Magoia Explore the Magical world of Magoia and take a stand against the darkness of "The Shadow". Charm Farm Help the adorable Shmoos, grow interesting crops and creatures, and use your magic spells to restore the Magic Forest! Asterix & Friends Build your own Gaulish village, fight the Romans and go on exciting adventures! Goodgame: Legends of Honor Prepare your heroes for battle! Fight fast-paced PvP battles and build an amazing empire in the great MMO game, Legends of Honor! Shakes & Fidget The free-to-play online game Shakes & Fidget sends you on a magical fantasy quest. Collect treasures, adventure points, and defeat terrible monsters! Goodgame Big Farm Combine business instincts and farming fun when you rebuild your uncle George’s farm. 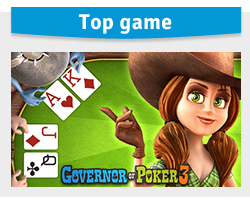 Governor of Poker 3 Free Your quest to become a poker pro will take you on a long journey through Texas. From poker rookie to the high-roller VIP of the Gold area! Cinderella Story Cinderella Story, your last-minute ticket to the Fairy Kingdom! Ludo Ludo! Will you be the first player to get rid of all the cards in your hand? Play it clever! Mafia Battle Become the most dangerous, powerful, and respected mobster in the world in MafiaBattle!